We design over 90 Individual Hotel covers. Each cover is personalized with the Hotel’s own logo. This insures that our Ads have access to over 4500 hotel rooms. It is also proudly displayed in most lobbies. 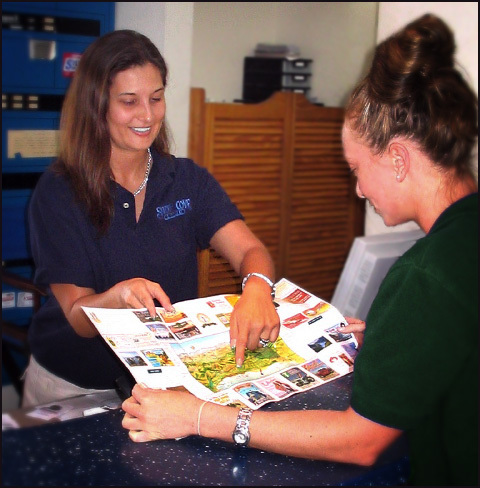 Our Welcome Map cover is distributed to our advertisers and the Chamber of Commerce, thereby increasing the exposure of our message to the daytime visitor. The Welcome Map reaches the traveler before they arrive because many of the Chambers of Commerce and Hotels send it to visitors requesting information about our area. Upon returning home, the visitor has a handy memento for a future visit or to give to a friend. Our Welcome Maps are online & can be viewed by thousands of visitors before they travel. Visitors to our website can see our Advertisers Ad, their location on the map, as well as a link to their website.